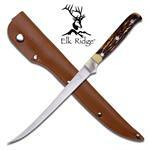 Elk Ridge 12 1/4 Inch Overall in length Filet Knife. Features Simulated Bone Handle. Comes with the leather sheath. 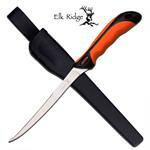 12 1/2" overall Master Fillet Knife with nylon sheath. 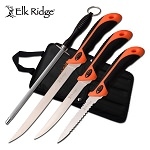 Elk Ridge Fillet Knife 12 1/8" overall. 6 7/8" 440 stainless steel blade. Full tang. Laminated wood handles with lanyard hole. Black nylon sheath. 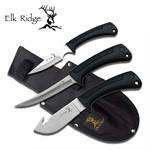 Elk Ridge Hunting Knife Set 3 Piece, Skinner Gut Hook Knife, 9.25" Overall, 4" Blade. 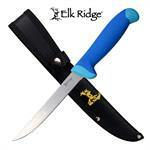 Fillet Knife 10'' Overall, 5'' Blade, Caper Knife 8'' Overall. 3'' Blade. 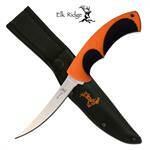 Includes Black nylon belt sheath hold all.